IT WAS originally designed for New York's iconic Central Park. Now it is coming to Rockhampton. 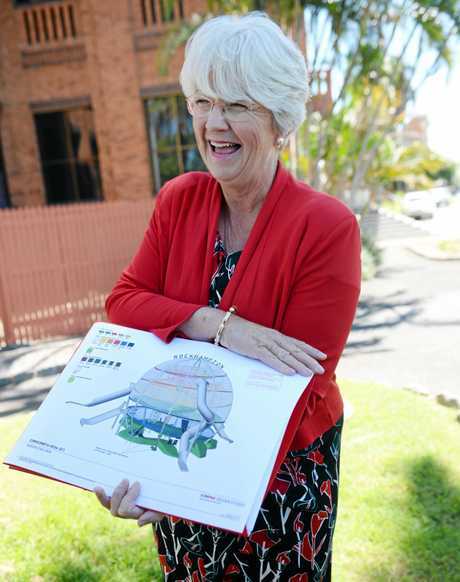 Rockhampton Regionmayor Margaret Strelow revealed yesterday Kershaw Gardens would have its very own 9m playground in the shape of a sphere. Cr Strelow said council had been trying to keep the exciting new feature under wraps but as soon equipment started being installed, it was hard for people to miss it. "You may have noticed coming over the new bridge and as you look to the right towards Kershaw Gardens, there is a very large spherical structure that has started to emerge," she said. "This was the big surprise." The structure has five playground storeys where children will be able to play 'snakes and ladders' to weave, climb and slide between the levels. 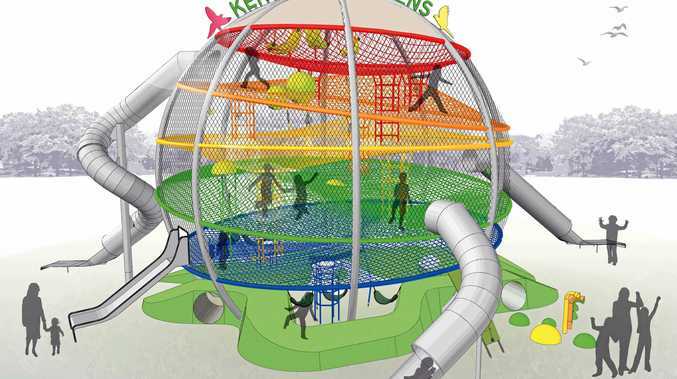 In collaboration with award-winning playground designers, Urban Play, this world-first Super Sphere play structure pushes the boundaries of playground design and innovation. "This is a really exciting project for Rockhampton, not only are they setting the benchmark in play on a national scale, but also a global scale with the world-first super sphere," Managing Director of Urban Play, Ben Urban said. "A major part of the design encourages kids of all ages to get outside, get active and challenge themselves. "The beauty of this playground is that parents can too challenge themselves and get involved in active play with their kids." "Thanks to Marcia of course, Kershaw will never be what was it before. We are not able, under state regulation, to replant the sorts of things that made Kershaw so wonderful, but we can put back extraordinary play structures and the biggest of those, the most amazing, the one that is unique to Rockhampton is Wyatt's Wonder Web," Cr Strelow said. There are four slides across the whole playground, swinging hammocks on the top level, climbing ropes, disabled access down the bottom and lights to bring it to life of a night time. Across the top of the structure, the word Rockhampton is spelt out in a steel, channelling Hollywood. "It is going to be linchpin that makes Kershaw Gardens Queensland's most extraordinary playspace," Cr Strelow said. Kershaw Gardens was destroyed by the wrath of Cyclone Marcia in 2015 and Cr Strelow said she couldn't wait to see it revived. "Certainly when my children were growing up we loved Kershaw Gardens," Cr Strelow said. Wyatt's Wonder Web is expected to be completed this month, and will officially open to the public with the remainder of the Kershaw Garden's redevelopment in winter. Cr Strelow said construction was going well. "The wet weather has impacted it and Kershaw Gardens being an old landfill, every time there is rain, the implications are greater than it may be in other areas," she said. "The contractors are working in there and doing a great job and we are looking forward to seeing it completed. "As people are starting to see from the road, we are hoping for an end of June date." The play centre has been estimated to cost just under $1 million, out of $14 million funding for the entire project. The attraction will also feature a monorail, flying foxes, swings, timber play towers, stone maze block, picnic shelters, new amenities, free Wi-Fi, and a wet play area.